The American Soldier has performed at The Kennedy Center, Library of Congress, American Legion National headquarters, Off Broadway and countless theaters and art center across the country for the past 4 and half years for veterans and audiences. It has been nominated for an Amnesty International Award for theatre excellence, received 4 stars at the Edinburgh Festival Fringe and been featured in The Huffington Post, The Military Times, The Washington Post and Time Out to name a few. The American Soldier is based on real stories and accounts from soldiers' letters written from the American Revolution through current day Afghanistan. It reveals the struggles American soldiers face at war and their internal struggles to come back home. The show strives to help us understand how and why it is so difficult for men and women in the armed services to re-enter our pedestrian life when they come home. It honors and exposes their flaws, their scars, their families and spirits with darkness and humor. The American Soldier is a veteran-themed play, but it is also a human story that shares how so many different nationalities and races have believed and committed to the idea of what makes America so beautiful. How so many men and women have put on, and are willing to put on the uniform, to fight, to defend and give the ultimate sacrifice for America, and what it stands for. The American Soldier is also an American story. "...if you want to make the most out of your trip to D.C., go see The American Soldier this inauguration weekend." "The American Soldier is definitely one of the five things you want to do this Memorial Weekend." "His one-man show…he honors our veterans in their own words…"
Know that each time you perform Douglas, you're touching people in ways they weren't expecting. And for those who had an idea what to expect, you’re touching them as well. Your performance was one of the most amazing things I have ever seen on stage. I served in Iraq and Afghanistan, and a lot of times when people come up to me and ask me how does it feel to experience war, I personally can never find the works to express my experience, the way your performance did. Your performance says it all and your play is a voice for veteran. Thank you! "This play is raw and incredibly emotional. It gives people who have never experience war or military service, a true and excellent idea of what is it is like. How it touches your soul, and changes your life." "Douglas, you have proved the power of drama in making the past relevant to the world today. The American Soldier makes history less about dates and events, and more about the lives of people. Thank you for bringing The American Soldier to the American Revolution Museum at Yorktown! 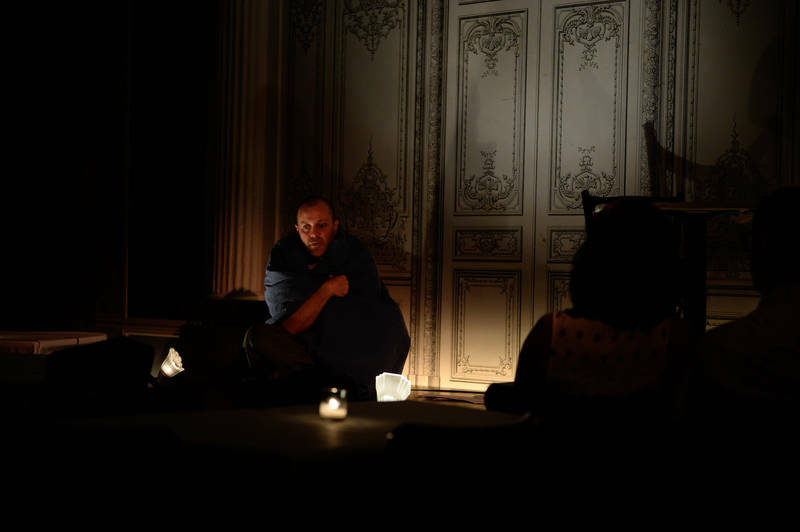 "Douglas Taurel’s compact solo play about war and its affect on the everyday soldier...is tightly crafted and effective!" "The two performances were unforgettable! Those that attended the two sold-out shows were moved beyond words at the power of the show and it's messages. " “The American Soldier powerfully brings home the impact of war on the people who live it day in and day out. He plays each character with passion, nuance and heart...a must-see!" “Douglas Taurel's performance of The American Soldier was an outstanding "tour de force", packed with heartfelt emotion and spirit. I was truly moved by the incredible stories and Douglas' ability to transform himself into 14 different characters. This is a show that I highly recommend to everyone! A Must See!" The American Soldier was everything I thought it would be and more. It’s hard for non-military people to understand what our armed service vets have gone through, but this show is the best way I have ever seen to start the much-needed conversation. Douglas Taurel’s spot-on characterizations take us deep into the darkness of the wars of the earth and of the human heart. With his deft writing and carefully selected material, we get to experience the effects of war from the perspective of veterans and their families through their own letters. It is deeply moving and illuminating, a glimpse into a kind of experience most of us will never know. This show is a great way to say thank you and to honor our vets for their sacrifices. If it comes to your area, don’t miss it! Better yet, find a way to bring the show to your area! We are honored that he was able to come and present at UNH! Sign up to learn about upcoming performances!